The Ogham Stone 2015/2016 – We’re Back! 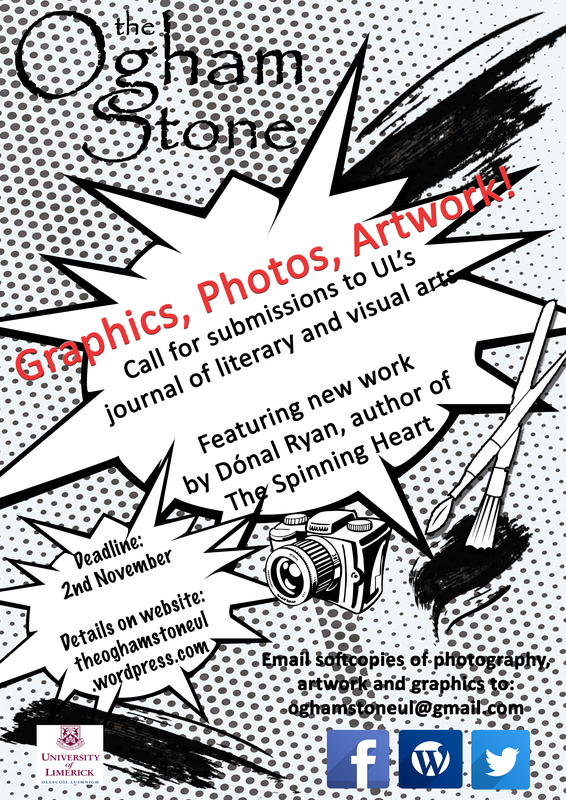 The Ogham Stone, the University of Limerick’s literary and visual arts journal, is getting ready for your submissions for the Spring 2016 edition. Last year, almost seventy pieces were accepted for publication, including short stories, flash fiction, poetry and artwork. They featured alongside an introduction by Joseph O Connor, Frank McCourt Professor of Creative Writing at UL and multiple-award-winning Irish novelist, as well as a short story by Donal Ryan, author of The Spinning Heart, long-listed for the Booker Prize, Guardian First Book Award winner and recipient of the European Union Prize for Literature at the London Book Fair in 2015. The 2014 journal was an eagerly sought-after item, with a voracious demand for copies. The Ogham Stone is quickly becoming a valuable platform for new writers and artists, local, national and international, to bring their work to a wide audience. We are particularly proud of our connections to the local creative communities in Limerick and last year featured work from writing and art projects active in the city, including The Heart of Limerick anthology and the ARTiculate competition. This year, as well as accepting fiction, memoir, poetry, visual arts and photography, our new team are happy to announce that we will be seeking short graphic novels and creative non-fiction also. Our call for submissions is imminent so browse our submissions guidelines here, buff and shine your offerings and watch this space for further details. The Ogham Stone Journal is looking for dynamic and bold artwork from artists around the world. The Ogham Stone, the University of Limerick’s literary and visual arts journal invites all writers and artists to check our submit page for guidelines when submitting to our stunning Irish publication. Thank you to everyone who submitted to the last edition of The Ogham Stone. Our editors are currently reading all the submissions and those who will be published will be contacted shortly.